Barry Hall Apartments - Fresnaye Accommodation. 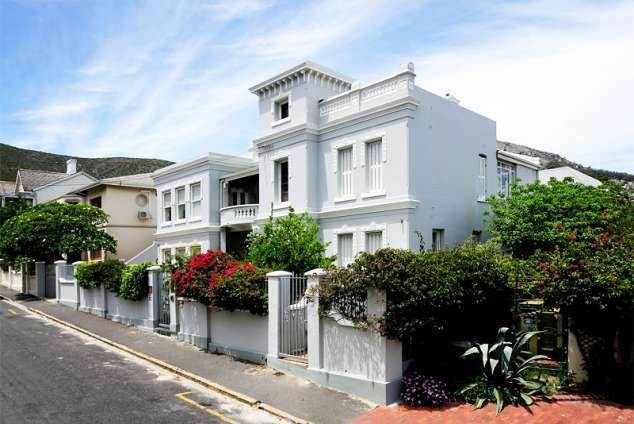 Barry Hall is located in the leafy suburb of Fresnaye on the Atlantic Seaboard, half way between the City and Camps Bay and Clifton beaches within 10 minute's drive in either direction. The location is extremely central. The 4 contemporary large apartments and garden cottage are located in a Historical manor House, with many architectural details, up to date free Wi-Fi as well as friendly daily service, weekdays leaves you free to enjoy Cape Town and all its beauty. We are 4 star rated by the South African grading Council. Apartment one, is a large (122m2) multi roomed apartment with direct access to our cozy court yard garden, and has its own private balcony, a real suntrap ideal for breakfast or sundowners. The apartment is modern Scandinavian in décor, and has two large double bedrooms with king size beds, ceiling fans as well as a smaller bedroom with a queen size bed, and sleeps 6 persons. There are 3 bathrooms, one en suite with shower, basin and toilet, one with bath/toilet, basin, and one with a large shower and basin. The generously sized kitchen is fully equipped with oven, microwave oven, dish washer and a 6 seater table with direct access to the courtyard garden. Lunch in the shade under the pergola is an option on a hot summer day or you could just chill out in a deckchair, or maybe have a barbecue/braai. Facilities are: DSTV, DVD, freeWi fi , and a private safe. Apartment 2 is a large comfortable multi roomed apartment (92m2), with one bedroom, separate kitchen, entrance hall, a spacious lounge/dining room, dining table for 6, two sleeper couches and contemporary furnishings. The bathroom was recently renovated and is a blend of modern/rustic style with large shower, basin and toilet, the bedroom comes with a queen size bed and ceiling fan, there is direct access to the garden from the bedroom. The kitchen is fully equipped including microwave oven, large fridge/freezer, dishwasher, oven and cooking top, as well as all cooking utensils. The large entrance hall with its desk and extra sleeper sofa set into a recess. offers a welcome sense of space not often found in rental apartments. The cozy courtyard garden for all our guests, has a barbecue/braai area, table and chairs, making it an ideal setting for a leisurely lunch under the wine covered pergola. Facilities are: DSTV, flat screen TV, DVD, freeWi Fi , and private safe. The large multi roomed apartment of 122m2 has two bedrooms and two bathrooms, one en suite with shower, basin and toilet as well as a romantic second bathroom with Victorian bath, basin and full shower. A delightful blend of furnishings incorporating Art deco, African furniture, and retro style makes the large lounge a unique space with a host of interesting objects. The large kitchen is fully equipped with Oven, Microwave oven, Dish washer, large fridge coffee machine and all crockery, pots and pans etc. A generous balcony with table and chairs is accessible through the lounge or via French doors from the second bedroom and is a great space for al fresco breakfast or sundowners. The cozy courtyard garden with a barbecue/braai area, table and chairs, making it an ideal setting for a leisurely lunch under the vine covered pergola. Facilities are: DSTV Satellite TV, DVD, and free WiFi connection. Apartment four is a large comfortable apartment (92m2), with 1 bedroom, entrance hall, kitchen and a spacious lounge/dining room with a contemporary blend of Scandinavian simplicity, mixed with African touches in the furnishings, it has a sleeper couch for an extra person. The bathroom has a walk in shower with a round window adding interest to the view of Lions Head. The bedroom has a king size bed, and private safe and the kitchen is fully equipped with convection microwave oven, oven, cooker and large fridge/freezer, as well as all cooking utensils. The large entrance hall with its welcoming ambiance leads to the charming small balcony. Our cozy courtyard garden is located at the back of the property and has table and chairs for dining and barbecue/braai, as well as deck chairs. Facilities are: DSTV, DVD, and free WIFI connection, and private safe. DSTV, Flat Screen TV , DVD, and free Wifi. There is a separate bedroom with a queen size bed, desk, and TV. The open plan dining/lounge/kitchenette has a bar fridge, Microwave oven, 2 plate Hob and utensils with dining for two. Our friendly housekeeper Zoliwe services the apartment daily, weekdays, and will take care of your laundry at a nominal cost. - Turn right into St Johns Road, OHR SAMOYACH synagogue is on the right hand corner. 34310 page views since 25 Jul, 2003. Last updated on 09 Jul, 2018.